Capitalism is doomed. The aged system has been increasingly unable to maintain people’s living standards since the 1970s. And now, everyone knows it. Thanks to the Occupy movement, the viability of an economic system based on greed and survival of the fittest has been called into question. And found wanting. We can thank the Occupy movement for two innovations in the art of political protest. The concept of the 99 percent versus the 1 percent has united everyone, no matter what their beef with capitalism, aka Wall Street. The other innovation from Occupy can be stated simply as, “don’t be distracted by specific issues,” which can divide us by substituting “effects” (issues) for “causes” (capitalism). The problem is capitalism, not high tuition, lack of medical care, foreclosures, homelessness, and the myriad other issues that confront most of us day by day. These are the effects of a system that serves the interests of a decreasing minority of the population (actually, far less than 1 percent). The time has passed for piecemeal solutions to these various issues. We must go to the heart of the problem, the system itself. It is true that a once vibrant capitalism built the economic powerhouse known as the USA. It did this at the direction of a group of ruthless entrepreneurs, beginning in the 19th century, who ran roughshod over their workers, their competitors and the environment. Decade after decade, they accumulated more wealth, more capital and more power. The problem with revolting against these “industrialists” was that they only controlled one corporation each, albeit some very large corporations. People not directly connected with the company as workers or consumers could only express solidarity at the latest outrage committed by the owner. This all changed in the late 1970s when finance capital, aka Wall Street, took control of nearly every corporation in the country. It was impossible for the industrialists to compete with the power and wealth of Wall Street, which controlled the great banks. Nowdays, nearly every corporation has the same owners, which are the banks and foundations where the 1 percent stash their money. There are still a few individuals like the late Steve Jobs, the Koch brothers and Rupert Murdock, who run their corporations without regard for Wall Street, but they are few and far between. And most of them are as bad or worse than the bankers. So what did the finance capitalists do when they achieved control of thousands of corporations? They maximized profits, of course. The effects this had on working people were devastating. At the beginning of the 1970s, Los Angeles County had three auto plants, four large rubber plants (making automobile tires), and the giant Bethlehem Steel Works. A few miles to the east was the even larger Kaiser Steel plant which made more steel than half the countries in the world. All of these plants paid good union wages with fully-covered health care and livable pensions. By the end of the decade they were all gone. Some of the plants packed up and moved to low-wage states in the South (”free trade” pacts had not yet been negotiated). Others were simply shut down, their products being imported from Japan or Europe. In spite of huge coalitions of workers and communities called “Save GM South Gate,” “Save Ford Pico,” or simply “Save Our Jobs,” thousands of relatively well-paid workers found themselves in unemployment lines, applying for minimum wage fast food jobs or selling the cars they used to build. A direct connection has been made by journalists and academics linking the demise of manufacturing jobs in South Central Los Angeles, East L.A. and the San Fernando Valley, with the rise of the cocaine and amphetamine drug culture, and the criminalization and incarceration of generations of Black and Latino men. 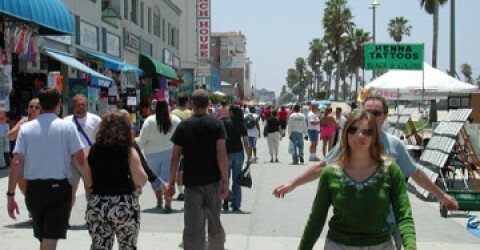 The Southern California experience was replicated across the country. The “rust belt” of the Midwest was comprised of mile after mile of abandoned and decaying factories. Every part of the country suffered massive job loss, broken homes, violence against women, racial tensions, loss of public facilities, swelling prison populations, psychological trauma and the beginning of massive homelessness. Even today, 40 years later, nothing has replaced well-paying union jobs for unskilled or semi-skilled worker. At the same time, rents and home prices have skyrocketed and real wages continue to fall. According to the U.S. Bureau of Labor Statistics, average weekly earnings peaked in 1977 at $310 per week. In 2004, they stood at $277.57 (in 1982 dollars). This only illustrates part of the problem. While real wages were declining, the wealth of the country grew nearly six fold during the same years. Where did this vast wealth go? A Congressional Budget Office study in 2011 found that the top 1 percent gained the most (a 275 percent increase in wealth) in the period between 1979 and 2007. In addition, much of our national wealth continues to be squandered on wars, weapons and a bloated Pentagon bureaucracy. The Occupy movement is motivated by a recognition, understood either emotionally or intellectually, that things are going very badly. It is obvious to most people that there are overlaying crises – the environment, the income gap, education, housing, health care, jobs and a declining standard of living. Piecemeal reforms in any of these areas are becoming harder to implement because of the huge economic and political power wielded by Wall Street. Since 2008, capitalism has been unable to function in a way that can calm the masses. As both mainstream and Marxist economists acknowledge, capitalism must grow in order to survive. That growth has hit the wall. There are too many things – homes, cars, clothes, airplanes, tools – you name it, for sale. All of which must be sold for a profit or someone is going bankrupt. Now the technological revolution has worked against capitalism by making it possible to produce more and more “things” with less and less workers (consumers), thereby creating a glut of unsold stuff. There is now a better than 50-50 chance that we are headed into a worsening, a double-dip, of the current depression. And after that? No one can say. At this point, it is important that the Occupy this-and-that stand their ground, and not be dispersed. The second wave is coming. It is made up of those who are watching and waiting – the foreclosed, the evicted, the long-term jobless – literally millions upon millions of people who have lost their faith in the current system, and have nothing left to lose. What will Occupy Wall Street or Occupy L.A. look like with millions clogging the streets for miles around? And what will happen in Washington when millions fill up the Capitol Mall and the government buildings, and do not leave? What will happen when the police, the National Guard and the army are no longer reliable enforcers of the 1 percent order? This is the nightmare scenario that they’re sweating about at JPMorgan Chase and in the Washington think tanks. But for the rest of us – a growing part of the 99 percent – it has the sound of liberation. What will come after our current rules of oppression – and rulers – are chased into oblivion? We can hope it will be a system based on equality and sharing, of concern for human welfare, not corporate profits. Perhaps the government will be based on General Assemblies, where everyone can have their say, that were created in the early days of this revolution by the Occupy movement. It is the hope and belief of Occupy supporters that the great wealth created by the people of the world, that is now being squandered by the 1 percent, instead can be used to ensure the economic security of the seven billion people on this planet. For the first time in our lifetimes, because of the failure of senile capitalism, and the willingness of millions worldwide to stand up and be counted, real change, not cosmetic change, is possible. to shake up the whole wide world. hittin’ every city where there’s a slave. Gonna feel this human tidal wave. So we’ll do a little night work. we’ll get extra cash another way. terrorizin’ folk. That’s gonna end. Hey, we got our army, too. 25 million jobless comin’ unglued. But all you got is your hate. whatcha gonna do when they cut and run? The World Wave keep on rollin’. Annihilate hunger, vaporize your greed. We’d like to take it slow, but it could be fast. your punk politicians will try to make us die. Rich man, where you gonna hide? Got a nickel for a coffee? We are in The Groove. in its arms. In its infinite arms. We are home. We are home. From end to end this town is hers. Others wave from their porches. A bit of pink or brightly blue, it’s her. One of a kind, A Venice woman. She’s up to nothing but good. sing that song of a woman’s ecstasy.